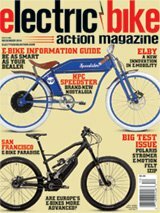 The word out of Arkansas is that the town made famous by Walmart (or vice-versa) will be hosting a firsttime e-bike festival for both public and industry consumption on June 6–9, 2019. The initial plan is to attract enough e-bike brands so that a large demo fleet will be available for consumers to ride in the city and local trails. Of note is the fact that Class 1 e-bikes are legal on all paved and natural-surface trails, including singletrack, in and around Bentonville and the city of Bella Vista. For more information, visit www.innovationcyclesfestival.com starting Saturday, November 3, or e-mail [email protected].